Semi-desert, foothills. Woodlands, shrublands, openings. Spring. This slender, dainty, and lovely (thus the Latin, "pulchra", meaning "beautiful") member of the Mustard Family grows in open, sunny, semi-desert areas of the Four Corners. The plant is easily passed by because it is so slender. 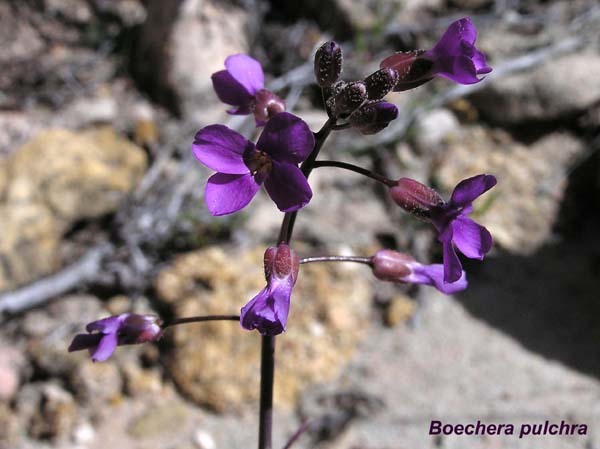 Flower color of Boechera pulchra varies from nearly white to pink to lavender-purple. Narrow, light green leaves are mostly basal in tight tufts. M. E. Jones named this plant Arabis pulchra in 1887 from a specimen he collected in Nevada in 1882.